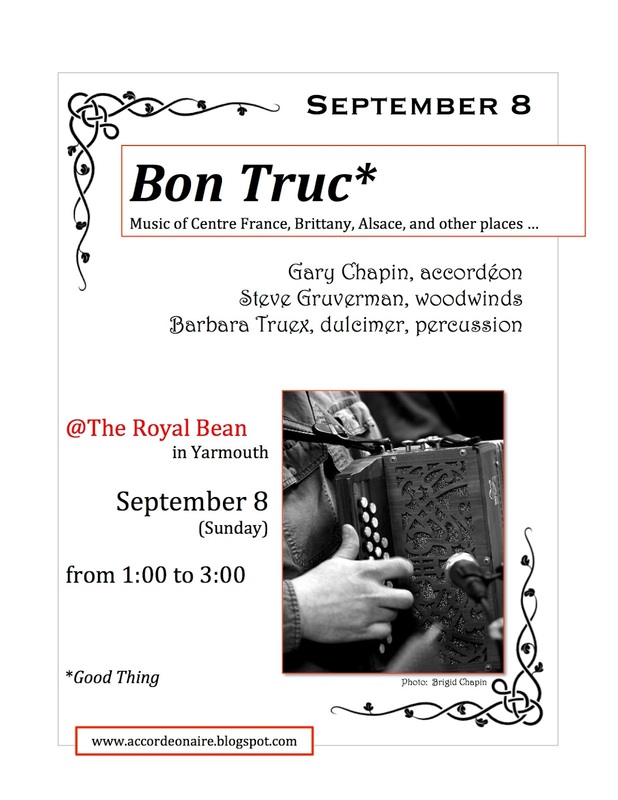 On Sunday, September 8, the trio Bon Truc will be playing at the Royal Bean, in Yarmouth, Maine, from 1:00 to 3:00. The trio comprises Gary Chapin (me) on accordéon, Steve Gruverman on woodwinds, and Barbara Truex on mountain dulcimer and percussion. Our repertoire is a quality blend of music centre France, Brittany, Alsace, and other places … plus some originals. We’ve played together for some time within the context of the dance band, Nouveau Chapeau. Recently, we started working specifically as a trio. After our first gig at the beginning of August, I felt, “Oh, yeah, THIS is why I started playing music.” It was very sweet. So join us on September 8. Drink some coffee. Eat pastry. Listen to great music. Next Post Where goest the Nik?